Can Your Next Pedicure Fight Toenail Fungus? 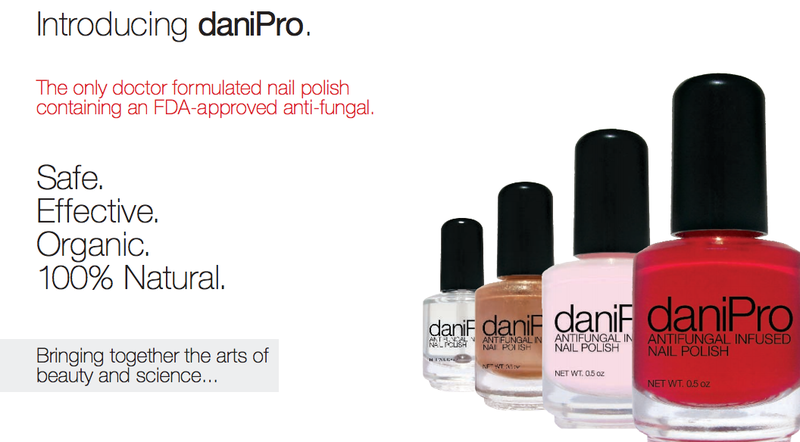 DaniPro nail polish is a product that claims to help prevent a recurrence of toenail fungus once the fungus has been properly treated. As anyone who has ever had toe nail fungus knows(characterized by a thickened, yellow and/or crumbling nail), it’s an easy infection to pick up again and again. With that idea in mind, a fellow podiatrist came up with the idea of DaniPro, a regular nail polish that’s infused with an anti-fungal agent (Undecylenic acid or UA) that claims to fight off infection while making your toenails look pretty. According to the FDA, however, UA only fights off fungal infections that live on the skin (like athlete’s foot) and is not approved as a fungal fighting agent on the nails. In spite of that fact, however, a 2008 study published in Foot and Ankle Specialist found that, when applied every two weeks in your podiatrists’ office (and mixed with glue, of all things) UA got rid of 100% of mild fungal infections and 35% of severe cases. So, what are we to think? A review of the product in The Wall Street Journal concludes that the nail polish, which sells for about $17 a bottle, likely won’t fight an existing infection but could help keep you from getting a new infection once your original problem has cleared up. And what do I think? In my Houston podiatrist office, I treat fungal toenails with one of three methods—topical or oral medications, or laser solutions. I also offer Keryflex, a product that allows you to remodel your toenail for aesthetic reasons without affecting your healing process. I KNOW these treatments are effective; I can’t guarantee that a nail polish will do anything, so I’d hate to endorse an expensive product that can’t always deliver the results it promises. If you want an effective, medically proven solution to your fungal toenail problem, schedule an appointment with Dr. Andrew Schneider today to begin the healing process.